Vacation properties can be targets for burglars, because these homes are often vacant for extended periods of time. 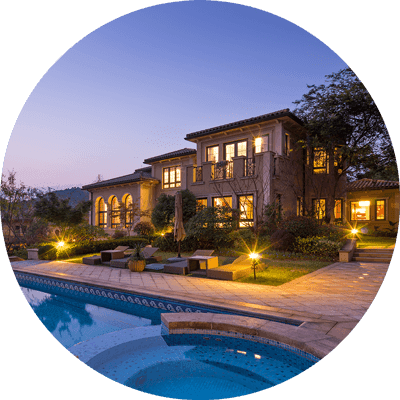 If you have a vacation home, take the proper security precautions to help protect your property–and your guests. Yard–Make sure your shrubs and trees are not blocking doors or windows. Keep everything healthy and green to help give the impression that someone is living there and maintaining the landscaping. If necessary, hire a gardener or a groundskeeper to maintain your property and keep it looking occupied. Equipment–Store tools, lawn equipment, ladders, and other valuable items in a locked tool shed, garage, or basement. Don’t store them outside where criminals could use them to gain access to your home. Security Cameras–You don’t need to invest in expensive outdoor cameras; installing dummy cameras gives the impression that the property is under surveillance. "Beware of Dog" Sign–A couple of warning signs about dogs may help keep people off your property. Just the threat of a guard dog is often enough to scare a burglar away. Avoid "For Rent" Signs–A "For Rent" sign can signal that your home is potentially empty. If you own a vacation rental, use print ads or one of the following websites to list your property Airbnb.com, FlipKey.com, HomeAway.com, or VRBO. Use motion-sensor lights to illuminate walkways, entryways, and windows. Inside your home, use timers for lights and stereos to create the illusion that someone is home. Use deadbolts on all of the exterior doors in your home. Remember that locks are ineffective if you have flimsy doors or weak hinges, so make sure that both are strong and sturdy. If your home is a vacation rental, invest in a keyless entry system instead of traditional locks. Keyless entries allow you to set up temporary access codes for each of your guests, and certain systems can even unlock the door from a computer if someone gets locked out. If you decide against keyless entry, the best method to get renters keys is by using a lock box. Don’t hide keys under doormats, flowerpots, or in mailboxes. Do give an extra key to a neighbor you trust or your housekeeper. Replace all locks immediately after buying the home or if you lose a key. Remember to close shades, blinds, and curtains so people can’t see inside your home. Keep valuables out of site. If you want to make the home look more inviting, open curtains on the second story. Replace old window locks if they are malfunctioning. If you are able to break into your house through a window, a professional burglar will have an even easier time. For sliding glass windows and doors, place a rod or dowel in the track to make it nearly impossible to open either from the outside. If you don’t rent out your vacation home, stop the mail, newspaper, and any other deliveries while you’re away. Accumulated deliveries signal that the home is unoccupied. Keep an inventory of your belongings and valuable possessions so you know if anything goes missing. If your home does get broken into, this record will help you discover what was taken. Getting to know your neighbors is one of the easiest and most effective home security measures you can take. If your summer or winter home is near neighbors who live there year-round, ask them to watch your home when you’re away. It’s important to let them know when you’ll be leaving, how long you’ll be gone, who will be staying there, and how you can be reached. Set clear guidelines and expectations for your housekeeper and groundskeeper. Make sure they are familiar with the home and all of your belongings so they’ll notice anything out of the ordinary. Provide your guests with clear guidelines to ensure they are taking proper safety precautions during their stay. Remind them what they should and shouldn’t do to keep themselves and the home safe. Encourage them to keep doors and windows locked, store valuables out of sight, and close blinds when away. Having a security system can help protect your home and may reduce your insurance costs. Make sure your security monitoring company knows you will have renters in the home. Also, give your renters a detailed explanation of how your alarm system works to help prevent false alarms. Explore various types of host guarantees, which can cover up to $50,000 in damages beyond the security deposit. If you list your home on a site like HomeAway.com, you can purchase an optional CSA Property Damage Protection plan, starting at $49 per reservation. This gives you coverage in case there is accidental damage, without requiring a damage deposit. Safes come in a variety of sizes and range in price from $50 to over $1,000. You can use the safe as a selling point for your guests, letting them know they have a place to store their valuables during their stay, or you can use it to secure your own belongings.